It's August, 1948, three years after the Russians "liberated" the nation from German Occupation. But the Red Army still patrols the capital's rubble-strewn streets, and the ideals of the Revolution are but memories. Twenty-two-year-old Detective Emil Brod finally gets his chance to serve his country, investigating murder for the People's Militia. The first victim is a state songwriter, but the facts point to a political motive. Emil would like to investigate further, but his colleagues in Homicide are suspicious or silent: He is on his own in this new, dangerous world. 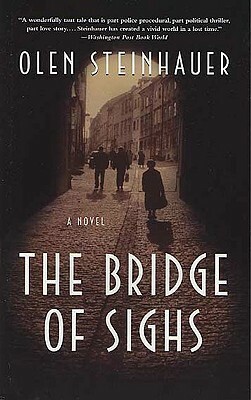 The Bridge of Sighs launches a unique series of crime novels featuring a cast of characters in an ever-evolving landscape, the politically volatile terrain of Eastern Europe in the second half of the 20th century.